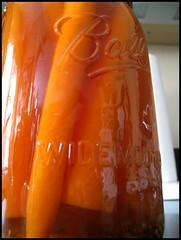 Jeni, I did make the carrots…more than once in fact. And even thought you’re right that I could have MacGuyvered a solution to not having the canning jars, those big ones have found permanent homes in my pantry. I use them to store rice, lentils, all sorts of dried goods.